The implementation of new systems, processes and organisational structures are all part of a company’s development and progression, however, it is crucial that your employees are ready for any changes that have been planned. Before embarking on a change initiative it is important that the people in your organisation are prepared for the culture change. Culture change can relate to certain behaviour within an organisation that has been established for many years but is not necessarily a positive contribution to the organisation. The change initiative needs to be led from all aspects of your team and for this to be successful, employees need to understand the reasons behind the change initiative so that they can embrace ideas but also contribute to the implementation. Change management in operational practice is most successful when structure and role definitions are adapted to suit changing circumstances in the way that a business is run. By developing a clear understanding and shared a way of thinking about the organisation, a culture of continual growth and learning can be achieved. Traditional change management workshops that form part of our IMPACT Toolkit™ are a good starting point to get a general overview. However, in order to develop a deeper understanding of ongoing change management skills that are required for long-term sustainability in a business, our IMPACT Programme™, a strategic change management programme, covers all these aspects and more. It is also important to develop the same vision, a shared way of thinking about the organisation, to avoid any signs of a ‘blame culture’ developing, favouring instead continual growth and learning. Organisations that are successful at change pay great attention to the level of performance of their teams. They do not assume that teamwork is a natural thing, they work at it. They continually review and develop team performance and they promote self-directed autonomy in teams. Successful organisations put a heavy emphasis on the level of performance and attitude of their individuals. They provide support for individuals to develop their true potential and put effort into extending personal capability and self-confidence. 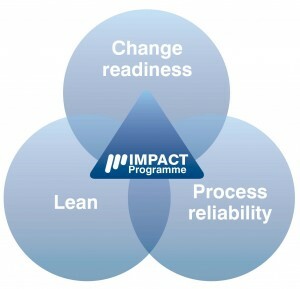 We offer development training at all levels of your organisation as part of our IMPACT Programme™. Our approach is practical, adaptable and specifically tailored to your requirements. Our commitment is to produce sustainable results to deliver increased value and reduced risk.